After the popularity of our Flure wedding dress, we have designed a slightly simpler version of the Flure Deb Dresses with straps for our debs. This classic boho style with a soft chiffon skirt, will have you gliding over the dance floor with class. Lace straps and a feature back give a unique perspective to the usual white deb dresses. 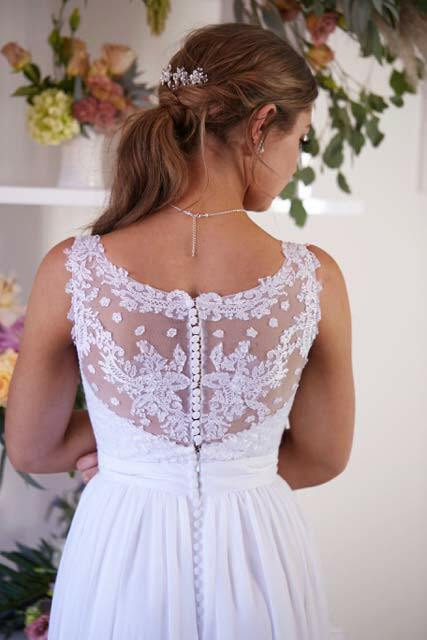 It’s all about the interesting back this year with low backlines or lace decoration. At Leah S Designs we have an on site alterations done by Ginger pins, most long gowns need the hem shortened and the straps adjusted. Usually fittings are done 4 to 5 weeks before the debutante with your shoes. It’s not easy to find cute white shoes, that’s why we have a gorgeous and comfortable collection. Im a little practical and have pretty flat shoes and heels with an ankle strap. With the Flure deb dress when matching jewellery I would go for a small jewellery set like the Sophia necklace and earrings. Or just medium earrings like our Infinity with the matching belt. 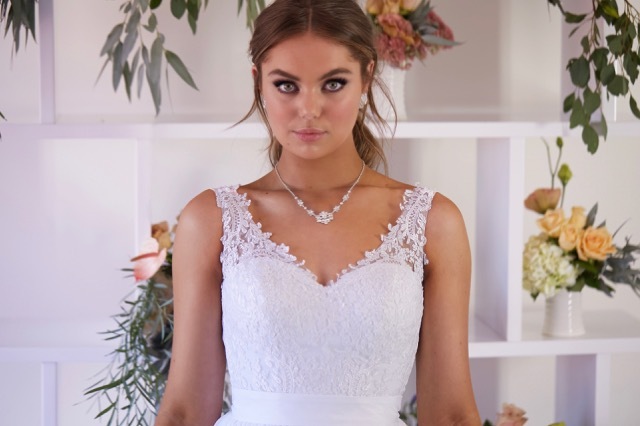 For our shoot April is wearing our chic necklace and earrings by Hello Lovers Australia and in store at Leah S Designs. We have matched the Glamour belt just because I love sparkle! We have a gorgeous collection of belts in store to choose from or just go plain and simple. 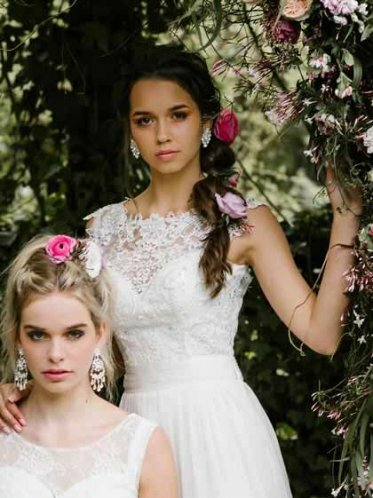 Wedding dresses and deb dresses dreams are made of. Looking for a deb dress that is individual an cant be found in bridal shops all over town. Thats right these designs are only at Leah S Designs in Hallam. You wont find them in Brunswick or Berwick Armadale or Mornington or any where else. We design and manufacture these stunning and affordable deb dresses with pride. Our wedding gowns also designed by us sizes 6 to 34. Stockists of Hello Lovers deb and wedding jewellery and accessories. 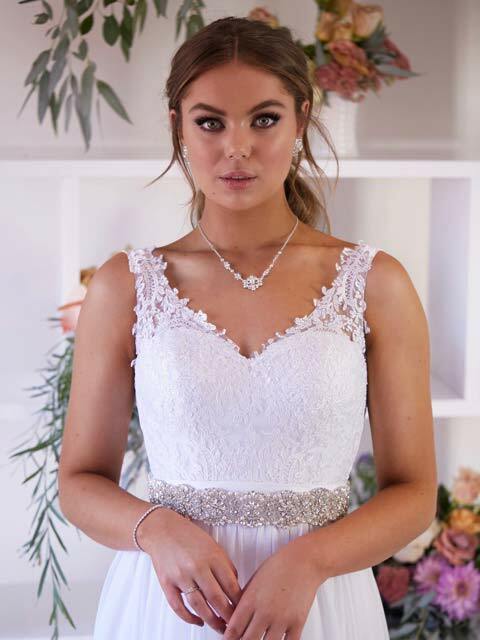 If you need to wear a bra check out the Jenny wedding dress with straps features full corsetry and excellent support for a bigger bust.